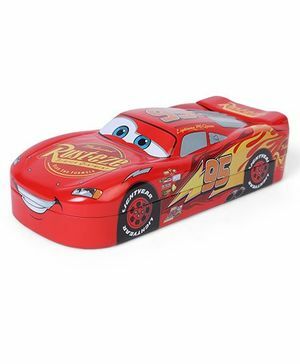 This pencil box from Disney Pixar Cars will be loved by kids. Features one main compartments and one special tray compartment. Attractive Cars print on it. Made of high quality and durable material. It is exactly as the pic..strong and nice?? Honestly I didnt like this product. Its too hard to open by a kid. Would not recommend to buy this. Just love this pencil box. Its same as displayed. Quality is also good, size and structure all are perfect. Must have option for you little one s.
Really nice pencil box. It is car shaped n exact replica of Disney pixar lightening McQueen car. My son absolutely loved it. It has 2 compartments. It can be budget birthday gift option too. Price could have been bit low so I have deducted one star. Thanks to fc for bringing this product and that too at best market price. the pencil box design is highly appreciable to original Steve McQueen car.